Wet food waste is recognised as the most problematic waste stream that complicates the effectiveness of most waste recycling activities. The majority of waste is clearly recyclable and if separated, it will substantially reduce the overall expenditure in the complex world of waste management. When food waste is separated, collected and treated effectively, it eliminates the methane gas release from landfills that is 20 times worse than CO2 in terms of green house gases (GHG). The treated food waste can produce methane for heating and cooking as well as fertilizer for agricultural activities, further cutting back on the use of depleting and polluting fossil fuels. Removing the food waste stream from the municipal solid waste generated from your building, development or city immediately enhances the quality of the remaining waste for separation – turning a once economically and environmentally depleting process into one that generates revenue, employment and supports the environment in a sustainable manner. We pride ourselves for having a variety of solutions primarily focused on food waste including a newly patented system that manages food waste better than any other known automated waste management system in the world today – using LESS POWER and requiring LESS SPACE, whilst being MODULARLY EXPANDABLE from individual buildings to entire districts, all that with a LOWER COST. STREAM offers multiple individual and hybrid solution options depending on the uniqueness of the food waste generated from your operational areas. We have integrated dehydrator systems, full vacuum systems, gravity vacuum systems and specialised organic waste transport systems. Each of our systems is uniquely designed, engineered and installed based on the best requirement identified for your application and budget. 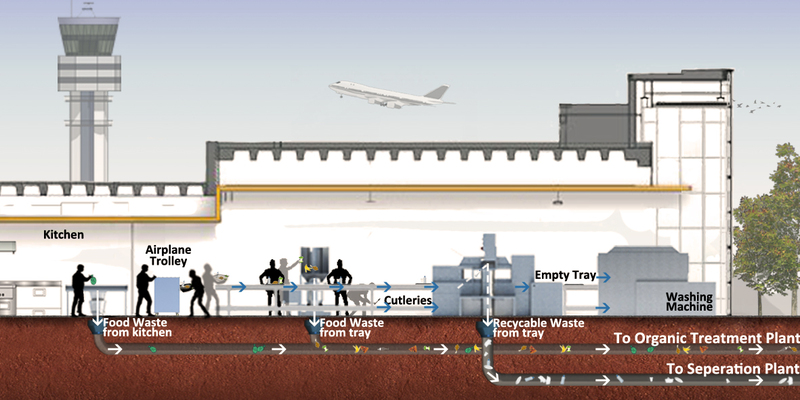 Food waste can be disposed into inlets or load stations and transported through the pneumatic infrastructure pipeline to a collection station or directly to a food waste treatment plant. From the collection station, the container can be hauled away to a treatment plant where the waste can be converted into gas for energy. This solution paves the way not only for the most environmentally sustainable mechanism for food waste but for the management of the remaining recyclable waste as well. STREAM is defining the way forward for food waste collection systems to be the next generation green utility infrastructure that is essential for a more populous world requiring green and sustainable infrastructure solutions.